Arnold is most certainly NOT ready for kindergarten: he’s convinced that his teacher, the affable Mr. Z, is actually the villain Zorgo. 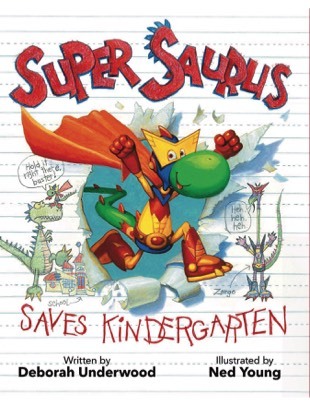 Fortunately, Super Saurus is on the case! His escape attempts are thwarted by Zorgo’s henchmen (aka Arnold’s parents), but it’s just as well—Super Saurus realizes he can’t leave a bunch of innocent children in Zorgo’s evil clutches. When a T-Rex (or is it a tiny lizard?) bursts onto the scene, Super Saurus’s super powers will come in handy—and Arnold just might learn that Zorgo makes a good ally. 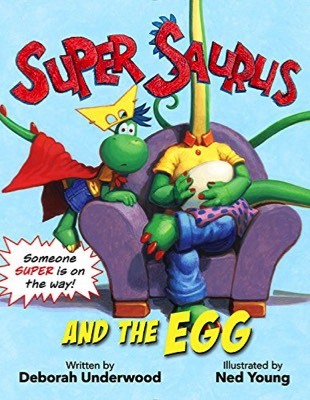 Arnold (aka Super Saurus, at least in his own mind) is more than a little suspicious of the egg which supposedly contains his new sibling. If his parents don&apos;t know whether it&apos;s a boy or a girl, HOW DO THEY EVEN KNOW THERE&apos;S A BABY DINO INSIDE? Convinced an arch-villain has secreted herself in the EGG OF DOOM, Arnold prepares as only Arnold can. When the egg hatches, either he gets a new sidekick OR the world is destroyed. Read the book to find out which! Get Your Super Saurus Coloring Page! 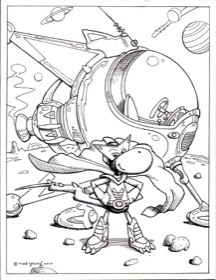 Click the black and white image to download the Super Saurus coloring page created by the book’s illustrator, Ned Young!